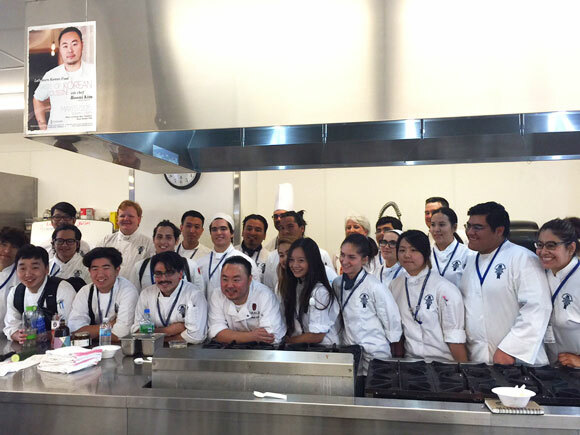 Chef Hooni Kim to the students of Le Cordon Bleu in Pasadena, May 5, 2015. Invited by the Korean Cultural Center Los Angeles to demonstrate Korean cooking to the students at Le Cordon Bleu cooking school, he flew across the country to share his passion. With such a broad subject to cover in one class, Chef Hooni Kim decided to focus on a few special ingredients, ones that really give Korean cuisine its unique flavors. One of these special ingredients is gochujang – the red chili paste with sweet heat and a fermented umami richness. It is definitely spicy – but also has a balanced fruitiness, slight smokiness and depth of flavor from the sun-dried Korean red peppers. 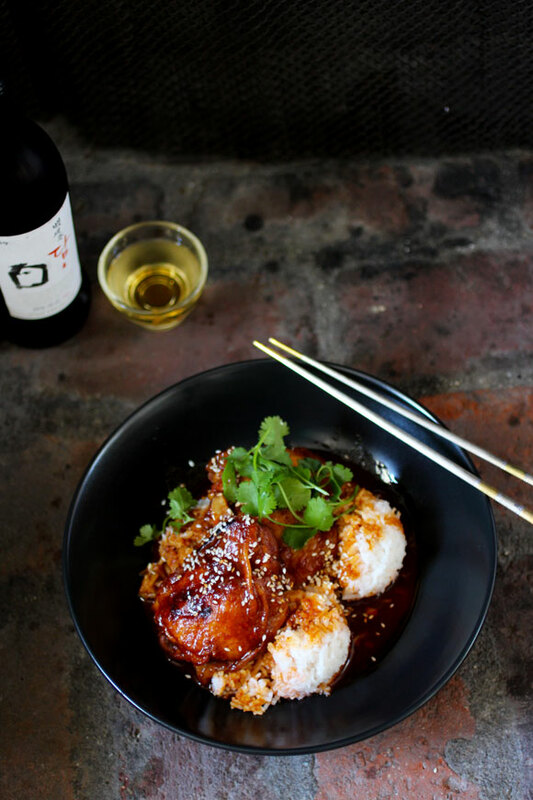 The menu at his Michelin-starred New York City restaurant Danji was inspired by his Korean-American heritage and his New York stomping grounds. The second restaurant, Hanjan, features pure Korean cuisine inspired by all his trips to Korea, the place of his birth. 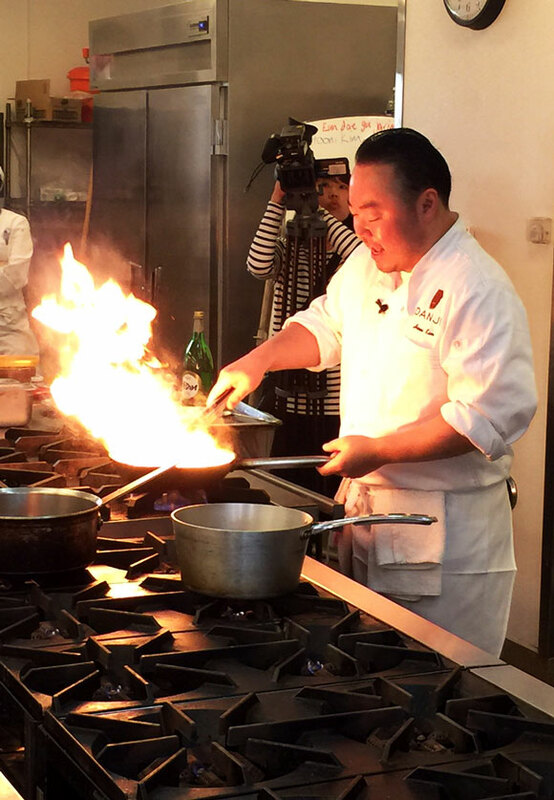 As a member of the media attending Chef Kim’s demonstration along with my colleague, Yuna Hwang from the Korea Herald Business, I had the opportunity to talk to the Chef and inquire about what is new in the realm of Korean cooking in America. The Chef explained that artisanal ingredients that would never leave Korea 5 or 10 years ago are starting to make their way here to the U.S. He generously gave me a jar of one of these products, an artisanal gochujang. Kamsahamnida, Chef! This natural gochujang is made in the traditional way, and is so much more complex – he says it tells a better story, a more honest story than the common supermarket brands. Alas, it is more difficult to cook with – being more salty, aggressive, and more dominant – but the level of quality is unmistakable. 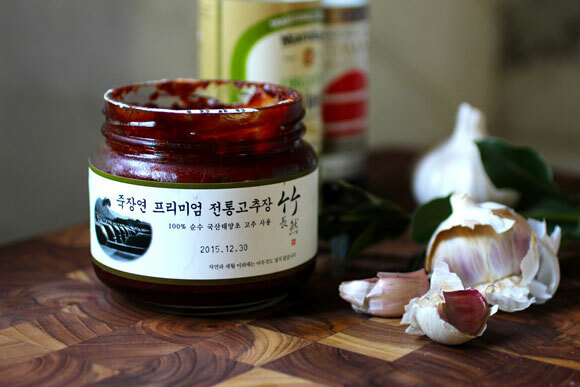 It is this premium gochujang that the Chef uses in his restaurants. Friends, if I’ve cooked for you, whether in LA or Chicago, you’ve probably had my version of Filipino Chicken Adobo. The Philippines’ national dish is simple. 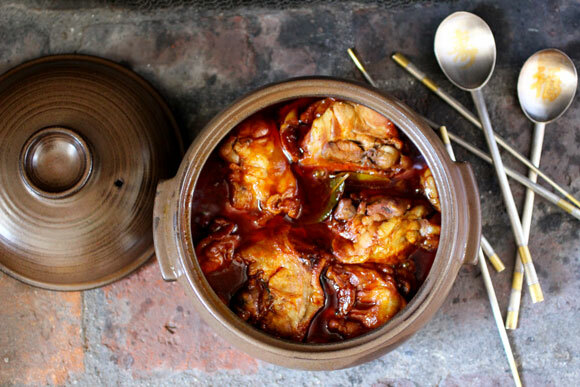 Just a few ingredients with no special technique – chicken thighs, soy sauce, vinegar, garlic, bay leaves, and black pepper – simmered for an hour. But such simplicity belies the truth about the dish’s magical harmony. 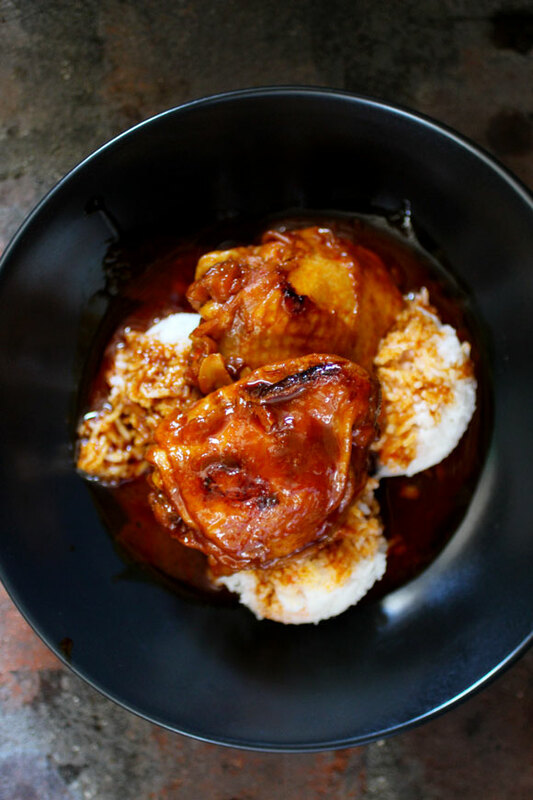 I agree with the Chef that “the food that you cook has to come from within.” I was excited to marry one of my favorite recipes (chicken adobo) with one of my favorite ingredients (gochujang). 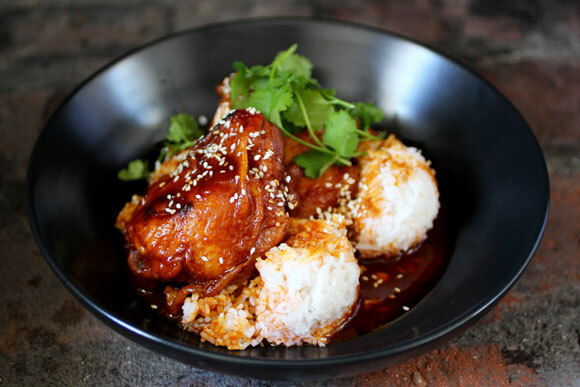 Enhanced by that smoky, fruity, exquisite spiciness found only in premium gochujang – this marriage takes chicken adobo to another level of complexity. I cook the chicken in a Korean ddukbaegi, an earthenware pot, traditionally used to cook and serve guk (soup) and jjigae (stew). The total prep time is less than 5 minutes, and the cooking time just over an hour. All in one pot. One spellbinding pot of magic. Heat vinegar and soy sauce in a medium-sized ddukbaegi. Whisk in the gochujang until smooth. Add garlic and bay leaves. Nestle the chicken thighs in the sauce, skin-side up. Make sure to choose a pot that is small enough so that the sauce covers most of the chicken when cooking. Bring up the temperature to almost a boil then turn down the heat, cover, and cook over low heat for 15 minutes. Turn the chicken over with tongs, and continue to cook, covered for another 45 minutes. After an hour total, remove the chicken, skim the excess fat, then replace the chicken in the sauce. In a Q & A session after the demonstration, one of the students asked Chef Kim about plating. 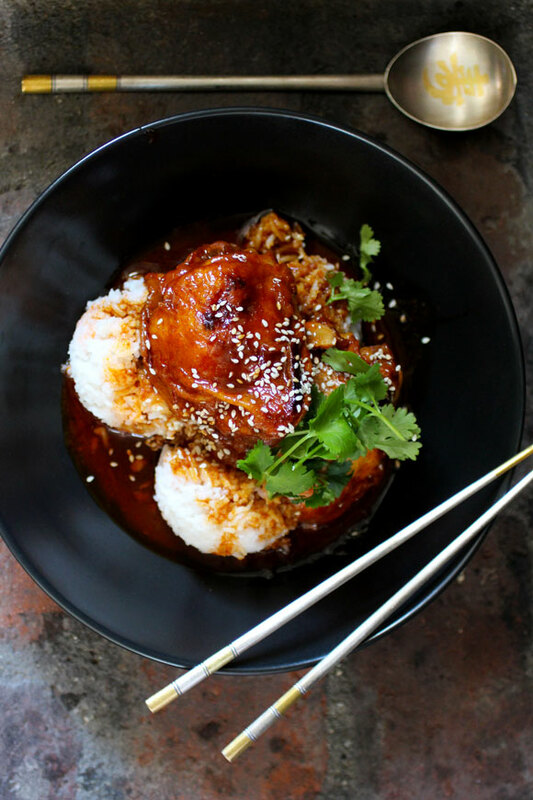 His advice was “don’t put more energy into plating than you put into the dish itself.” With the prep time for this dish under 5 minutes, I simply serve the chicken with sauce over white rice, then garnish with toasted sesame seeds and cilantro. 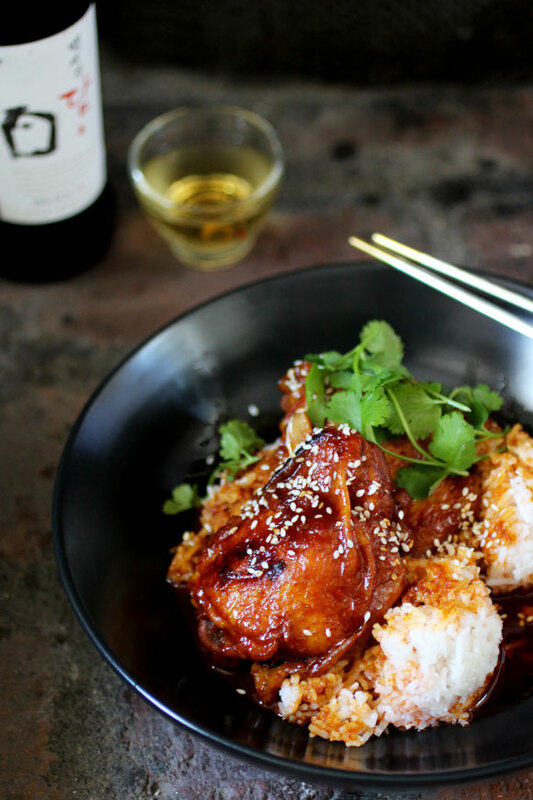 We enjoyed this chicken dish with cold Bek Se Ju DRY, a Korean glutinous rice-based fermented alcoholic beverage infused with ginseng and several other herbs which is an especially good match for gochujang chicken. Summer Soiree is a season long franchise where Food Network editors team up with bloggers to share recipes about everyone’s favorite summer dishes. Be sure to check out the Pinterest Board with over 300,000 followers called Let’s Pull Up A Chair! Agree that ANY food one cooks has to come from ‘within’!! Lovely, simple tasty wonderful dish I ofttimes make!! Plating: I do love when that is innovatively done, do notice, do remember – BUT quite obviously the flavour ill always shine through first!! !